Great opportunity for summer learning! This course is considered the ground level and most essential component of our program. You will establish a good sense of time keeping, musicality, and technique. The course is also an introduction to the family of percussion instruments including drum set, snare drum, hand percussion, mallet percussion, orchestral percussion. By taking this over the summer, you will advance quickly and be able to start the fall with intermediate courses or ensembles if you choose! Pre-requisite: Audition. Contact mcook@fullcoll.edu for more information and to schedule! This course explores the rehearsal and public performance of standard percussion ensemble literature. This is where you use the tools and techniques you've learned in classes or lessons and apply them to making art with other musicians. We will give a performance in May 2016 and possibly travel across Southern California to various festivals. This course is considered the ground level and most essential component of our program. You will establish a good sense of time keeping, musicality, and technique. The course is also an introduction to the family of percussion instruments including drum set, snare drum, hand percussion, mallet percussion, orchestral percussion. This course covers the techniques needed to perform percussion instruments such as snare drum, hand-percussion, mallet percussion, orchestral percussion, and drum set at a professional level. This is typically offered as a continuation from the "Intermediate" class offered in the fall and it is assumed you know how to play various styles on drum set, play your scales on mallet instruments, and know all of your rudiments. This course teaches the fundamentals of popular drum set techniques including: Jazz, Rock, Latin, and Pop drumming styles through lecture, demonstration, text, audio and video recordings and class participation. It is most common to take this course after completing MUSA 170F because you will need to read music quickly (not just by ear!) and be very comfortable playing with a metronome. This course is a continuation of MUSA 173F and teaches popular drum set techniques including: Jazz, Rock, Latin, and Pop drumming styles through lecture, demonstration, text, audio and video recordings and class participation. This coures is best suited to students with both drum set experience and intermediate reading skills. Prerequisite: MUSA 173 F with a grade of "C" or better or Audition establishing elementary sight reading skills. This course teaches advanced drum set techniques that apply to popular music styles including: Jazz, Rock, Latin, Pop and their many subcategories, through lecture, demonstration, method text, audio and video recordings and class participation. This course is a continuation of the "Advanced" classes offered in the Fall. If you consider yourself advanced but have not taken percussion classes at FC, enroll in 270F. Fullerton College is the longest continually operating community college in California. In the percussion program at Fullerton College, we believe in giving our students the opportunity to experience a multi-focused and complete percussion education. We cover drum set, hand percussion, and electronic percussion alongside mallet and classical studies. Typically students graduate and continue their studies in higher education, but some students choose to join the creative workforce upon graduation. Each student chooses their own goal, and we help design a path to keep them accountable and excited about their art. The Fullerton College Music Department has the largest music department in the California community college system. We have over 900 music majors and offer over 100 classes in music appreciation, music history, music theory, applied music, commercial music, piano pedagogy, and sound recording. Most students participate in one or more of the 25 performance ensembles. When measured against the enrollments of all other music programs in California, the Fullerton College Music Department ranks #1. Best known for his jazz stylings, Johnson is equally versed in all forms of pop drumming and has performed with a range of entertainers from singers Julie Andrews and Andy Williams to Surf-rock pioneers Jan and Dean to big band legends Billy May and Les Brown. Johnson has been the driving-force behind the Atomic-Age lounge ensemble, the Jet Set Quintet and contemporary organ trio, 2+1B3. And, as a founding member of the Tony Guerrero Quintet, he tours with multi-Emmy and Golden Globe Award-winning actress, Jane Lynch (Glee, 40 Year Old Virgin). 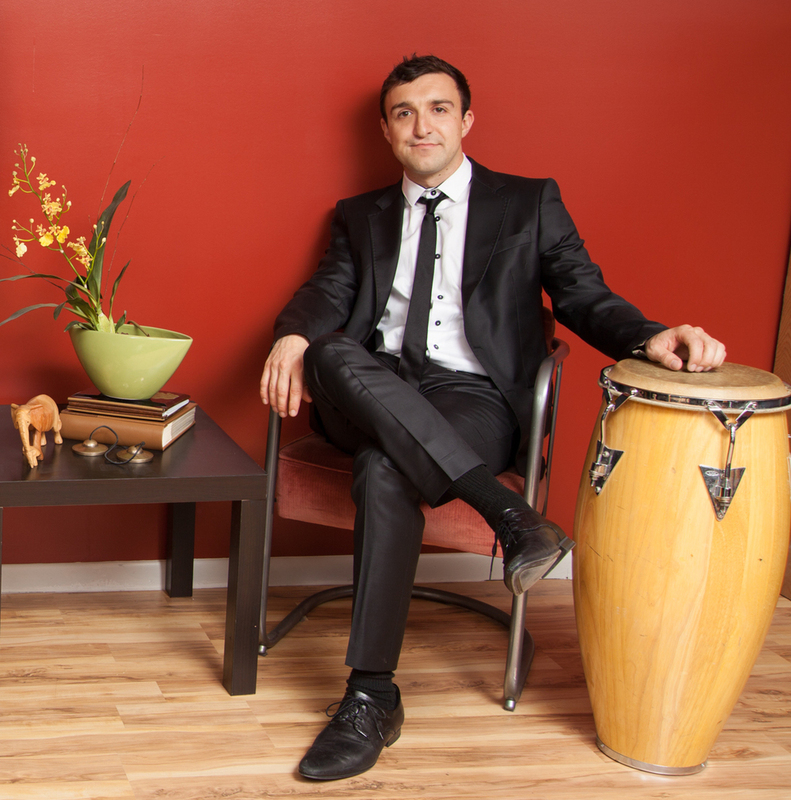 Jordan Curcuruto is a percussionist specializing in contemporary solo and chamber percussion music, speaking percussion, world music, and popular music. She enjoys collaborating with composers on new pieces and within the last few years has participated in several premieres, including Bryan Jeff’s Contactual Constellations at the 2014 Percussive Arts Society International Convention, the west coast premieres of John Luther Adams’ Inuksuit (Ojai Music Festival) and Elliot Cole’s AMEN (Northwest Percussion Festival), and most recently Michael Gordon’s Natural History at Crater Lake in celebration of the Nation Park Service Centennial with the Britt Festival Orchestra. Jordan has also performed with the Los Angeles Percussion Quartet, Left Edge Percussion, and as a guest percussionist with the Orange County Youth Symphony at the Walt Disney Concert Hall. In 2015 Jordan was selected to perform a solo concert at the inaugural Transplanted Roots International Percussion Symposium in Montreal. She is a three-time alumnus of the nief-norf summer festival and is presenting a new, self-composed solo work at the 2017 New Music Gathering. Jordan can be heard on the Southern Oregon University Percussion Ensembles’ CD, Electric Rebel Poetry, and on the Innova label release, 30, by Stanford University composer Mark Applebaum. Jordan earned her Bachelor of Music at Chapman University with Nick Terry and Justin DeHart, and her Masters of Music Performance at the Oregon Center for the Arts at Southern Oregon University with Terry Longshore. Currently, Jordan teaches at Fullerton College and freelances across Los Angeles, California. Having abundant performing opportunities is a unique advantage of studying in a collegiate environment. Through ensemble playing you will not only experience a platform to practice performance skills, but you will also network with other future colleagues. You will learn how to thrive in a team environment, and create meaningful art at a high level! These ensembles are audition based to find the right fit for each student. Contact mattjohnson@verizon.net or mcook@fullcoll.edu for more information on auditions and enrollment. Access to a studio to develop your craft is essential for ANY artist. As a percussionist, noise and space are serious considerations. 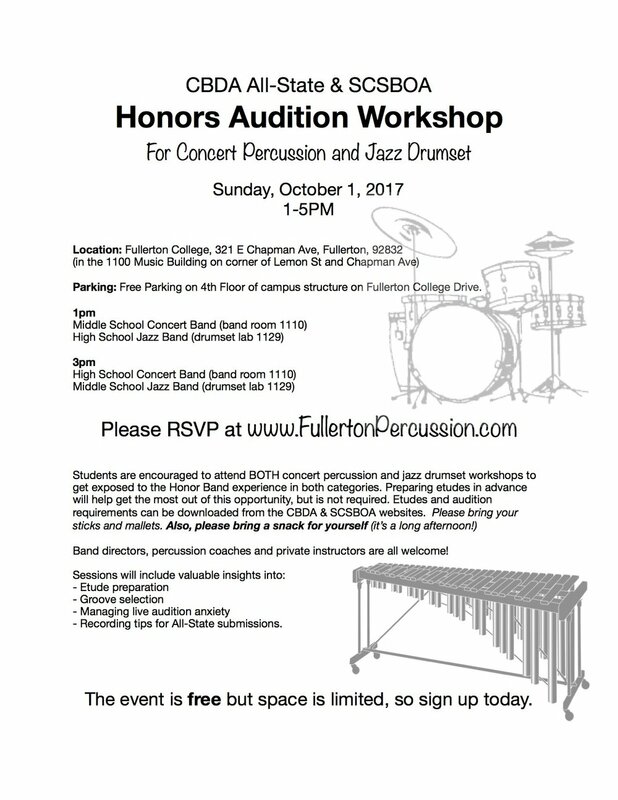 At Fullerton College, the percussionists have a place to practice, schedule rehearsals, and make professional quality recordings. In addition to numerous practice rooms, there are several large ensemble rehearsal spaces and our one-of-a-kind Roland Digital Drum set Lab. In the fall of 2011, the Fullerton College music department installed a state-of-the-art Digital Drum Set Lab that revolutionized the way drum set and percussion techniques are taught at the school. The sophisticated lab features Roland TD-9K2 V-Drum equipment and is only the second of its kind in the nation. The twelve-station lab utilizes a two way communication network that allows the instructor to lecture and demonstrate to the entire class or select individuals. This allows each student to progress at their own pace and improve their skills more quickly. The facility is used as both classroom and practice lab, illustrating Fullerton College’s commitment to providing its students with the most cutting-edge digital technology available today. Any questions about the workshop? Leave them here!